Trent Collins threw for 226 yards and six touchdowns to set a new record for TD passes thrown in a single game as Mississinawa Valley shut out Bradford on Friday night, 41-0. Blake Scholl runs wide looking to get around a Bradford defender Friday night. 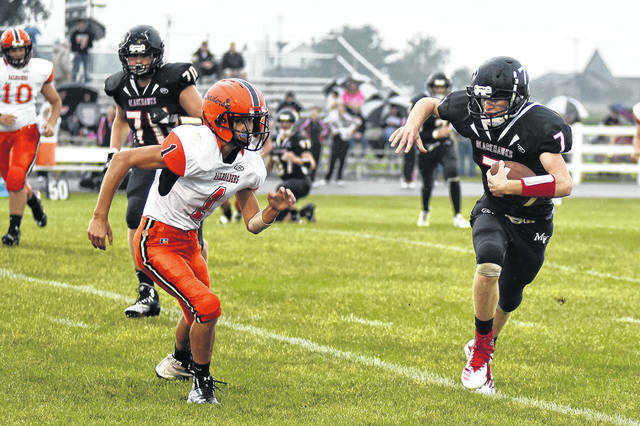 Scholl had 4 catches for 36 yards and a touchdown in Mississinawa Valley’s 41-0 win over the Railroaders. Bradford’s Hunter Gheen gets pulled down from behind by a Mississinawa Valley defender. 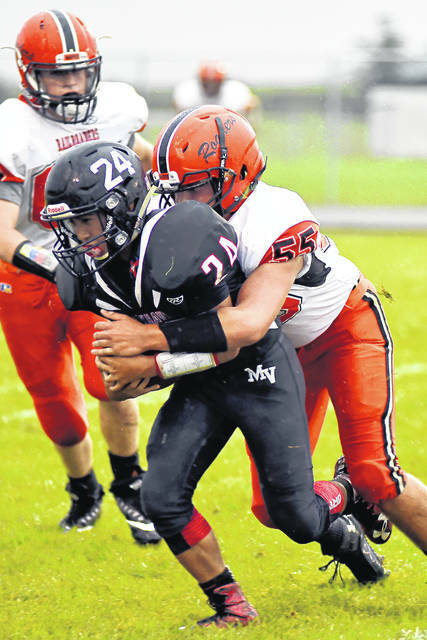 Mississinawa Valley’s Josh Fett (24) was among QB Trent Collins’ favorite targets on Friday. He had 3 receptions for 74 yards and two touchdowns in the Blackhawks 41-0 win over Bradford. Bradford’s Larkin Painter (80) tries to avoid a Mississinawa Valley tackler on Friday night. 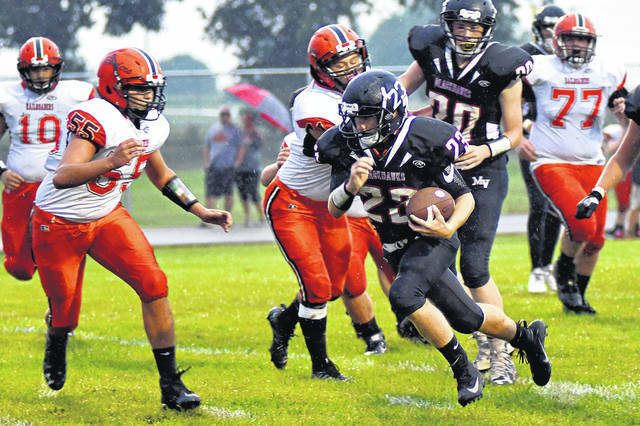 Mississinawa Valley’s Max Dirmeyer (23) tries to get outside the Bradford defense on this run Friday night. Bradford’s Taven Leach (21) takes off with the ball during the Railroaders’ 41-0 loss at Mississinawa Valley Friday night. Bradford’s T.J. 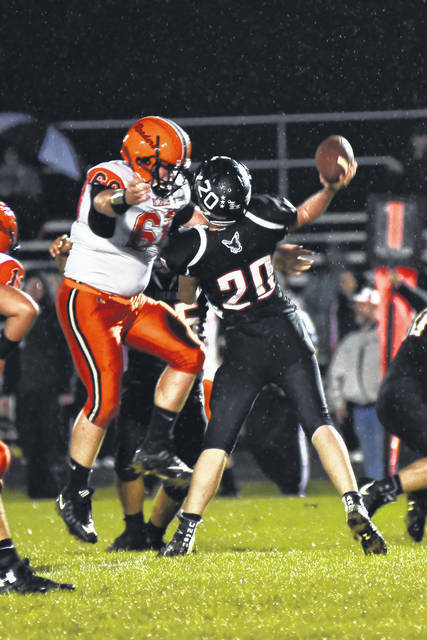 Brewer (63) gets in the face of Mississinawa Valley thrower Zach Connor (20) during Friday night’s football game. Mississinawa Valley’s Will Hall (37) tries to avoid a couple of Bradford defenders on this play during Friday night’s 41-0 win over the Railroaders. 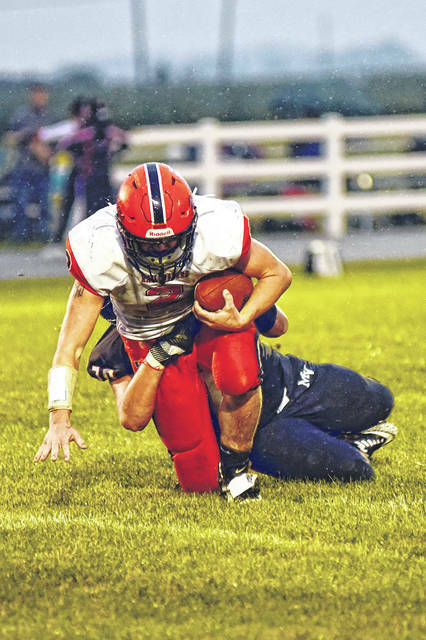 UNION CITY – It was a sloppy night in the aftermath of a monsoon and a constant light rain Friday night, but that didn’t dampen the enthusiasm or spirit of the Mississinawa Valley football team. 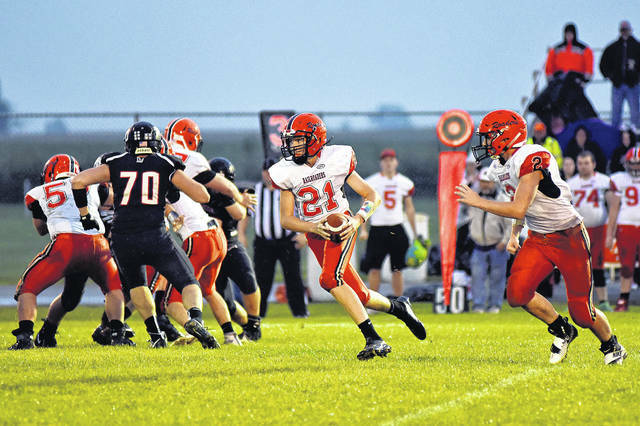 The Blackhawks struck pay dirt on their opening drive and then turned a number of Bradford miscues into points on their way to a 35-0 halftime lead and a 41-0 Cross County Conference win over the Railroaders. Mississinawa’s opening drive featured a couple of nice catch-and-throws from Trent Collins to Blake Scholl and two nice runs from Will Hall that was capped off by a short Collins to Josh Fett TD reception to put the Hawks up 6-0. MV took advantage of the wet field and recovered an onside kick to set up another score. Will Hall caught a pass over the middle and weaved his way through traffic racing to the end zone for a 48-yard score. The two-point conversion was good to Blake Scholl and the Hawks led 14-0 at 6:43. Bradford on their first possession of the game and series in the game was forced to punt and mishandled the snap setting up the Hawks on the 35-yard line. A nice throw from Collins to Fett for 30 yards led to a short 2-yard Collins to Scholl TD and Max Dirmeyer added the two-point conversion run to give MV a 22-0 lead. Collins hooked up with Fett and the speedy, shifty back took it 54 yards for the touchdown and with the Collins extra point kick the Hawks led 29-0 with two minutes still left to go in the first quarter. Bradford’s next possession saw some success as the Railroaders earned a few first downs moving the football, but eventually punted back to the Hawks. Mississinawa showed a chink in their armor and fumbled the football back to Bradford, but they were unable to move the ball. Mississinawa scored one more time before the end of the first half on Collins’ fifth TD pass of the night to Max Dirmeyer to build a 35-0 halftime lead. 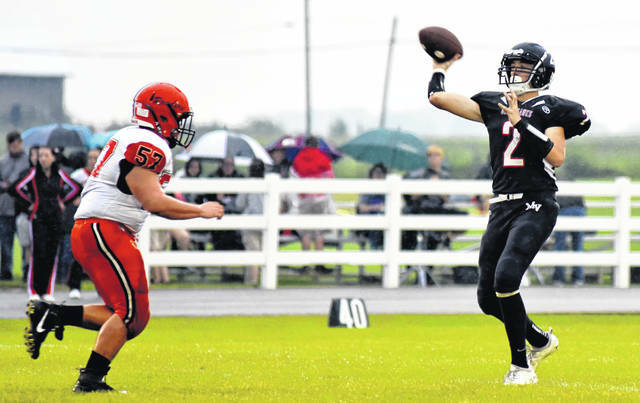 The touchdown pass established a new Mississinawa Valley record of five in a single game. Collins added to it in the second half with a sixth scoring pass to Will Hall to conclude the scoring and a 41-0 win. For the game Collins completed 12-of-16 passes with half of those going for touchdowns and 226 total yards. His efforts earned him the Hawks “Player of the Game” honor. On the receiving end, Blake Scholl had 4 receptions for 36 yards and one TD, Josh Fett 3 receptions for 74 yards and 2 TD’s, Will Hall collected 2 catches for 84 yards and 2 TD’s, Max Dirmeyer had 2 catches for 21 yards and 1 TD, and Dylan McGee had 1 reception for 18 yards. Defensively, the Hawks yielded just 56 total yards in the shutout – a feat that hasn’t been accomplished since the 2009 season. That pleased first-year head coach Steve Trobridge. The Hawks improved to 2-1 on the year and 1-0 in the conference. You have to go back quite a few years to find a Mississinawa team with 2 wins let alone 2-1 after three weeks. The last team to get back-to-back home wins was in 2013, and this marks the most points scored in a game since the 2009 team. “Their success is all on them, everything these guys are doing is because of them and how they compete. That’s what we have preached since day one. I’m so happy for them to be 2-1 right now,” Trobridge said. This game was a lesson on being opportunistic by taking advantages of opportunities and not making mistakes that allows your opponent back into the game. 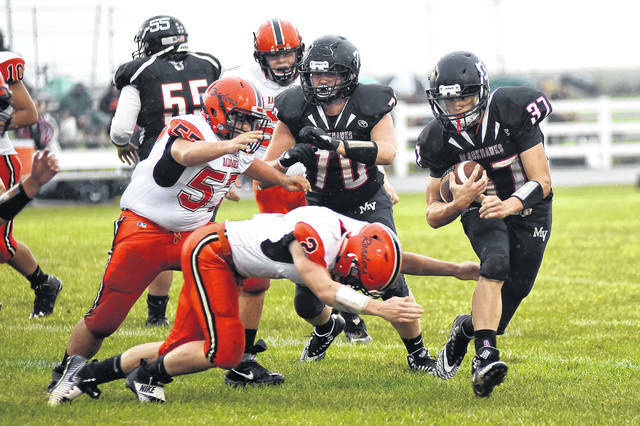 “In the past Mississinawa has struggled with making mistakes and having them compound,”Trobridge said. “Tonight showed when we do things right and execute good things happen. Mississinawa will travel to Tri-Village next week to take on another 2-1 team, while Bradford will host Arcanum. This entry was tagged Blackhawks, Blake Scholl, Bradford, Cross County Conference, Josh Fett, Mississinawa Valley, Railroaders, Steve Trobridge, Trent Collins, Will Hall. Bookmark the permalink.